Double X Science: Are children today really suffering nature deficit disorder (TM)? Are children today really suffering nature deficit disorder (TM)? Maybe you've heard of the scourge plaguing modern-day children, the one known as Nature Deficit Disorder (TM). You won't find it in any of the standard diagnostic manuals used to identify true disorders, but the "disorder" arises, so the story goes, as a result of keeping children inside for fear of their safety and "stranger danger," loss of natural surroundings in cities and neighborhoods, and increased attractions indoors that prevent spending time outdoors. This "disorder" is supposed to be an effect of modern times, the combined effects of controlling and fearful parents along with the irresistible screen-based attractions indoors. As a result of this "disorder," children can allegedly be susceptible to any number of ills, including less respect for and understanding of nature, depression, shorter life spans, and obesity. Concerns like these, it seems, have arisen with the advent of each new technological advance. One wonders if the invention of the wheel raised alarms that children might move through their natural surroundings too quickly to take them in. At any rate, while the person who invented this disorder, Richard Louv, has actually trademarked the term, it doesn't seem to have made a big splash in the scientific literature. Given that studies are lacking--i.e., completely absent--about "nature deficit disorder," one thing we can do is take a look back at how children lived before the technological age to see if their indoor-outdoor lives and exposure to the natural world were substantially different. Go far enough back in human history, and of course, we all spent a lot of time outside. But how did we spend our time with the rise of civilization? Children in agrarian societies then and now worked from dawn to dusk as part of the family to put food on the table. In such a position, they certainly had no lack of exposure to nature, although how much they appreciated that endless grind could be in question. That is, of course, if they didn't die in infancy or early childhood, as a large percentage of them did in spite of all that fresh air and time outside. But what happened with children and how they spent their time with the rise of towns and cities? In early times, many of those cities were walled compounds, not necessarily hives of scum and villainy, but generally stacks upon stacks of living quarters existing solely for functionality. Nature? Outside the walls, where danger--including the most extreme kind of "stranger danger"--lurked. Cities that lacked walls, as ancient Rome did for a long period, still were more focused on efficient crowding and function far more than on nature, with only the wealthy having gardens, the modern equivalent of today's back yards. In general, there were people, there were buildings, and there were more people. Not wildly different from, say, Manhattan today--except for that whole natural jewel known as Central Park. This piling on of people, brick, mortar, more people, and wood continued for children who didn't live in agrarian societies. With the Industrial Revolution, what may have really been a nature deficit disorder for a child living, in, say, London, became a genuine threat to health. 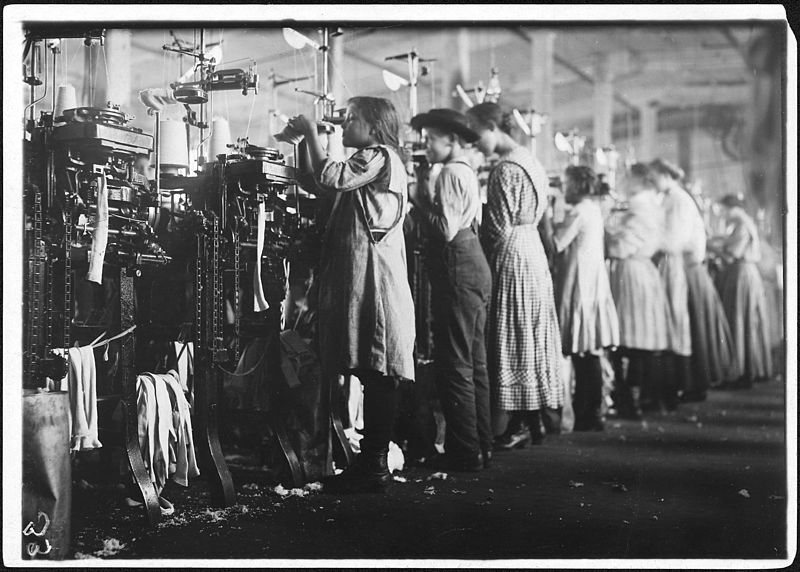 While they certainly didn't have television to keep them indoors, they also didn't have child labor laws. The result was that children who once might have been at work at age 4 in a field were now at work at age 3 or 4 in a factory, putting in 12 or so hours a day before stepping out into the coal-smoked, animal-dung-scented air of the city. Child labor wasn't something confined to Industrial Revolution Britain, and it continues today, both for agriculture and industry. I do wonder if the children harvesting oranges in Brazil feel any closer to nature than the children weaving carpets in Egypt. Likely, there are deficits more profound for them to worry about. The trigger for this overview of whether or not things have really changed over recorded history in terms of children's exposure to the natural world is this series of articles in the New York Times (NYT). In case you hit the paywall, it is the NYT's "Room for Debate" series and includes four articles addressing whether or not nature shows and films connect people to the natural world or "contribute to 'nature deficit disorder'" by keeping people glued to screens instead of being outside. Louv, the coiner of "Nature deficit disorder TM", is one of the four contributors to the debate. He argues that viewing nature documentaries can inspire us to go outside. He also thinks many of us grew up watching "Lassie" instead of the "Gilligan's Island" my generation watched, but perhaps there's not a huge difference between Timmy in the well and Gilligan in the lagoon and consequent outdoor inspiration. At any rate, Louv does argue in favor of viewing nature shows, although from a very first-world perspective (like the Romans and gardens, we don't all have back yards, for example). Perhaps the least-defensible perspective is the argument that Ming (Frances) Kuo, an associate professor of natural resources and environmental sciences, has to offer. She compares nature documentaries to "junk food" and offers the obvious: They're no comparison for the real world. For some reason, she implies that someone has argued that when you have access to TV, you don't need access to nature, saying, "Scientists have been discovering that even in societies where just about everyone has access to a TV, Internet, or both, having access to nature matters." I honestly don't think anyone's ever argued against that. Does "nature deficit disorder" exist and is indoor screen time with nature documentaries to blame? In addition to the historical observations I've made above suggesting that children from previous eras haven't necessarily been wandering the glades and meadows like wayward pixies, all I have to offer is a bit of anecdata, and I'm curious about the experiences of others. Historical comparisons suggest that city-dwelling children are no more deficient nature-wise today than city-dwelling children of yesteryear. But do nature documentaries help... or hinder? When I was young and watching too much "Sesame Street," "Gilligan's Island," and "Star Trek," the only nature show available to me was "Wild Kingdom" (Mutual of Omaha's, natch). Other than that, we had nothing unless a periodic NOVA episode came on public television. I was interested in science and nature, but acquiring knowledge outside of what I read in a book was difficult. As a resident of the great metropolis of Waco, Tex., yes, I had a natural world to explore, but let's face it: The primates there weren't that interesting, and bluebonnets get you only so far. I had no access to real-life live-motion visuals, auditory inputs, or information delivered in any form except what I could read in a book. Talk about sensory limitations. These days, my children have a nature documentary library that extends to dozens and dozens of choices. And they have watched every single one, some of them repeatedly. That's not to say that they don't also have dozens of well-thumbed field guides and encyclopedias covering fossils, dinosaurs, plants, bugs, sharks, rocks--the usual obsessions of the young who are interested in nature. Our "movie nights" often kick off with a nature documentary, and our pick of choice will frequently be one involving narration from David Attenborough. My children want to be David Attenborough--so do I, for that matter--and I can't recall ever really having that feeling about Marlin Perkins or Jim Fowler. And the upshot of that access to an expanse of nature documentaries I never had is that their knowledge of nature is practically encyclopedic. I'm the biologist in the family--or at least the one who has the biology degree--but my children often know more than I do about a specific plant or animal or ecosystem or area of the world, all thanks to these documentaries they watch. And when we're outside, they extrapolate what they've learned, generalizing it to all kinds of local natural situations. Do children today just need to be moving around more, somewhere, somehow? Oh, yes. But watching nature shows hasn't exacerbated some kind of "nature deficit" my children might have, Minecraft obsessed as they are. And these documentaries haven't replaced "real" nature with televised nature. Instead, the shows have expanded on and given context to the nature my children encounter, wherever that is--city, country, farm, sky, ocean, parking lot, grocery store, or even inside their own home, which is currently the scene of a sci-fi-like moth infestation that has triggered much excitement. I'd hazard that far from causing a deficit, nature shows have given my children a nature literacy that was unknown in previous generations. What is your take on nature deficits and nature documentaries?